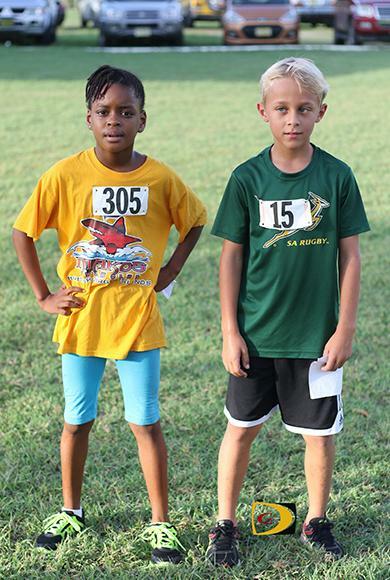 Sampson, who's preparing for next month's OECS event in St. Vincent and the Grenadines, led the field before being overtaken by Sam Potgieter to finish in 6 minutes 40.64 seconds behind Potgieter's 6:37.49. She chopped her time from the 6:54.2 she ran earlier. Potgieter's course record is 6:34.56, established in the second race. Reuben Stoby was the overall race winner in 11:32.57 and sewed up the title. He was followed by Julius Farley. "I knew I would have won the series if I won this race and that's what I came out to do as comfortably as possible and try not to go too hard on this course because it's pretty difficult," Stoby said. "I'm not ready to even think about the record (of 10:45.3), maybe sub 11:00 I should be having in mind, but, I definitely want to chase the record in Virgin Gorda on Nov 5, so hopefully, I have what it takes to do that." Katrina Lindsay won her second successive women's division to jump in the driver's seat for her first overall crown, after crossing the line in 13:57.55. "It was a good race, nice course but a bit hot," noted Lindsay, who overtook early leader Saungie Liburd, who was running with the Rotaract Club. "I noticed from last time that she always goes out fast and I like the hills so I let her go and bring it back-or try to anyway." ONE MILE (Under 9 & 11) Boys: 1. Sam Potgieter, 6:37.49. 2. Malik Christopher, 6:43.07. 3. Noe Peyronnet, 7:03.64. 4. Charlie Potgeiter, 7:06.57. 5. Kael Chalwell, 7:10.68. 6. Sasha Daly, 7:13.30. 7. Rush Broderick, 7:13.55. 8. Latriel Williams, 7:24.39. 9. Graton Grant, 8:26.38. 10. Niklaus Vorgel, 8:30.26. 11. Travique Forbes, 8:30.55. 12. Antonio Maduro, 8:32.42. 13. No Name, 8:45.55. 14. Keyshawn Barnes, 9:18.66. 15. Caleb Quayle, 9:19.72. 16. Devonte Smith, 10:36.95. 17. Zaed Chalwell, 10:37.18. 18. Barnaby Killourhy, 12:20.23. 19. Seun Frett, 12:48.30. 20. Lemuel George, 12:59.31. 21. Zaviyon Beazer, 15:25.18. 22. Eli Ghiorse, 25:06.55.Girls: 1. Khadija Sampson, 6:40.64 (NR; old record 6:54.2.). 2. Asia McMaster, 7:47.80. 3. Olivia Quayle, 7:56.18. 4. Martha Killourhy, 8:10.08. 5. Chanecia Pinnock, 8:16.84. 6. Sofia Chilton, 9:43.76. 7. Mckenzie Crabbe, 10:16.92. 8. Lilly Smith, 10:47.44. 9. Kijana Callwood, 11:05.62. 10. Elizabeth Ormond, 11:06.00. 11. Ava Ghiorse, 11:08.34. 12. Z'Hara McLean, 12:08.28. 13. Amarisa McLauren, 12:39.83. 14. Jardiana McLean, 13:26.64. 15. Catrin Jones, 15:05.20. 16. Evie Mayo-Smith, 15:25.18. TWO MILE: Open Men: 1. Reuben Stoby, 11:32.71. 2. Julius Farley, 11:58.57. 3. Samuel Romney, 12:10.88. 4. Guyp Dubois, 13:36.77. 5. Zebalon Mclean, 13:42.66. 6. Adrian Dale, 13:53.98. 7. Patrick Ormond, 13:55.90. 8. Wanyae Belle, 14:45.15. 9. Ikyjah Williams, 15:07.74. 10. Kareem Allette, 15:09.75. 11. Jayden Augustine, 15:12.72. 12. Alric Smith, 15:25.59. 13. Sergio Danlas, 15:58.99. 14. Malik Romney, 16:22.80. 15. Chad Willock, 16:26.05. 16. Dylan Penn, 17:31.16. 17. Howard Moore, 18:45.84. 18. John Cullimore, 19:12.93. 19. Elvette Dore Sr., 19:18.56. 20. Travis Forbes, 19:55.22. 21. Jim Cullimore, 20:21.48. 22. Shane Donovan, 20:26.90. 23. Bill Kinkead, 21:15.35. 24. Barry Leon, 23:19.70. 25. Jordon Dawson, 24:11.36. 26. Creighton Brewley, 25:03.20. 27. Matai Frett, 28:26.41. 28. Kalan Forbes, 29:22.30. 29. Gethil Jones, 35:21.68. Open Females: 1. Katrina Lindsay, 13:57.55, 2. Rosmond Johnson, 15:02.91. 3. Kay Reddy, 16:12.18. 4. Jahtivya Williams, 16:59.01. 5. Philomena Robertson, 17:03.27. 6, Kaeli Alphonso, 17:29.48. 7. Roslyn Gilbert, 20:06.20. 8. Amy Quayle, 20:14.86. 9. Shirley Liburd, 21:40.36. 10. Michelle Dennis, 22:51.73. 11. Akeela McMaster, 22:52.01. 12. Lynelle Gumbs, 23:33.09. 13. Abriel Magloire, 27:06.47. 14. Kaiola Rhymer, 27:09.03. 15. Jardana McLean, 28:10.96. 16. Kristin Frazer, 28:17.04. 17. Dawn Brewley, 28:28.09. 18. Sophie Dabbs, 31:24.39. 19. Jennifer Thomas, 33:25.66. Primary Schools Teams: Cedar School Primary (CS), Francis Lettsome Primary (FLPS), Joyce Samuel Primary (JSPS), Pelican Gate (PG), Willard Wheatley (WWPS) 1. M'Khori Crabbe (JSPS-1), 16:57.24. 2. Angel Beato, (JSPS-2), 17:07.84. 3. Jahshani Farrington (FLPS), 18:28.98. 4. Jesse Cockburn (JSPS-1), 20:24.12. 5. Jahnare Farrington (FLPS), 20:37.59. 6. Jessimee Estridge (FLPS), 22:28.09. 7. Kavon Wheatley (FLPS), 22:47.02. 8. Jayden Fahie (JSPS-2), 25:09.42. 9. Cheyanne Castello (FLPS), 25:44.42.10. Makeda Gumbs (JSPS-1), 25:54.37. 11. Anjeni Benjamin (JSPS-1), 25:57.87. 12. Litzy Beato (JSPS2), 27:08.70. 13. Sanjay Henry (JSPS1), 27:09.93. 14. Anica Penn (JSPS2), 27:29.10. 15. Ricky Haywood (FLPS), 32:15.28. Points: 1. Francis Lettsome Primary, 30. 2. Joyce Samuel Primary Team 1, 39. 3. Joyce Samuel Primary Team 2, 36 (4 participants). Secondary Schools Teams: Cedar School (CS), Elmore Stoutt Carlisle House (C), St. Georges (St.G): 1. Giovanni Grant (CS), 23:52.81. 2. Aria Creque (CS), 28:46.48. Service Clubs: Rotaract Club (RC), Rotary of Road Town (RR), Rotary Sunrise of Road Town (RS), Rotary of Tortola, (RT): 1. Michael Killourhy (RT), 12:42.25. 2. Saungie Liburd (RC), 14:51.31. 3. Devon Letteen (RS), 16:55.03. 4. Vanessa King (RT), 17:30.53. 5. Marvn Flax(RS), 18:15.15. 6. Henry Creque (RT), 18:44.43. 7. Valery Lionel (RC), 19:55.69. 8. Richard Parsons (RR), 20:11.91. 9. Allison Gumbs (RC), 20:38.62. 10. Kenneth Morgan (RT), 24:23.21. 11. Jolly Lou (RT), 25:28.70. 12. Doug Arter (RS), 27:33.65. 13. Tuneisha Johnson (RC), 27:41.76. 14. Donna Arter (RS), 34:49.06. Points: 1. Rotary of Tortola, 32. 2. Rotaract, 31 (4 participants) 3. Rotary of Sunrise, 34 (4 participants). 4. Rotary of Road Town, 8 (1 participant). Community Partners: BVI Swim Team (BVISWIM), Cedar School Parents/Teachers (CPTA), Digicel (DIG), H. Lavity Stoutt Community College (HLSCC), Joyce Samuel Parent/Teachers (JSPTA), Limitless Fitness (LF), Montessori Parent/Teachers (MPTA), Pelican Gate Parent/Teacher (PGPTA1. Kedrick Matthews (DIG), 13:32.85. 2. Al Broderick, (CPTA), 13:47.18. 3. Juliane Potgieter, (MPTA), 14:27.80. 4. Rachael Mayo-Smith, (DIG), 15:20.32. 5. Jessica Broderick, (CPTA), 15:27.50. 6. Keon Sampson, (BVIST), 16:46.39. 7. Anna Kinkead, (CPTA), 17:04.00. 8. Dennis De LaCruz, (PGPTA), 17:09.15. 9. Matthew Cockburn, (JSPTA), 17:25.75. 10. Cayley Smit, (PGPTA 2), 17:46.13. 11. Kurt Salapare, (BVIST), 18:29.31. 12. Earl Henry, (HLSCC), 18:34.74. 13. Brian Marshall, (BVIST), 18:54.06. 14. Chris Potgeiter, (MPTA), 19:05.56. 15. Kassia Nichols, (BVIST), 19:14.96. 16. Rhiannon Jones, (CPTA), 19:21.99. 17. Steve Augustine, (PGPTA), 19:34.26. 18. Zaldy Salapare, (BVIST), 20:11.59. 19. Garfield Nieta, (MPTA), 20:16.06. 20. Martin Cherry, (HLSCC), 20:43.18. 21. Mitchelle Jalova, (PGPTA 2), 20:58.56. 22. Claire Santillan, (PG PTA), 21:04.88. 23. Jodil Borjal, (PGPTA2), 21:46.88. 24. Darryl Flanders, (HLSCC), 21:50.22. 25. Vergel Meache,l (PG PTA), 22:20.25. 26. Lenette Lewis, (HLSCC), 22:30.90. 27. Christine Esser, (MPTA), 22:33.80. 28. Aqueelah Frett, (JS PTA), 27:08.42.29. Swain Henry (DIG), 27:27.04. 30. Trisha George, (JS PTA), 28:38.50. 31. Bernice Magloire (DIG), 29:53.89. 32. Rovelyn Dimaala, (PGPTA), 30:14.40. 33. Michelle Diaz, (PGPTA 2), 30:15.14. 34. Andrea Grant, (JS PTA), 30:29.24. 35. Jaden Marshall, (BVIST), 30:30.42. 36. Beverley Cupid, (DIG), 30:54.12. 37. Kate Robledo, (PGPTA), 33:00.15. 38. Jonel Peralta, (PGPTA), 33:01.85. 39. Christine Hernandez, (PGPTA), 33:02.55. Points: 1. BVI Swim Team, 63. 2. Digicel, 100. 3. Pelican Gate PTA-Team 1, 104. 4. Cedar School PTA, 30 (4 participants). 5. Montessori PTA, 28 (4 participant). 6. HLSCC, 82 (4 participants), 7. Pelican Gate PTA-Team 2, 87 (4 participants). 8. Joyce Samuel PTA, 101 (4 participants).